Both towpaths were thronged with refugees heading south. Bony Lizzie, freshly-escaped from the Spook’s bonds, has grand ambitions: to take for herself the throne of isle. She has harnessed the services of a tunnel-dwelling buggane, an evil creature which thrives on stealing the animas, or life force, from its unsuspecting victims. With the buggane as her secret weapon can she become an all-powerful Witch Queen? 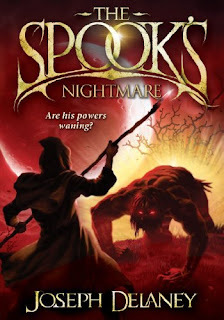 Source: Info in the About The Spook's Nightmare was taken from the book series' website at http://www.spooksbooks.com/spooksnightmare.asp on 19/01/2011. Ooooo why I wonder. Cool teaser. Hmm, new book to me all together. Wow. Interesting.